I would like to apologize in advance for the number of times you will probably see this chambray shirt in the next few weeks – it seems that I am in lurve. (Not love, that’s just not a strong enough emotion for this shirt, it is definitely lurve). I have actually been looking for a chambray shirt that fits how I want it to for the last two years, and can you believe I found it at Sears hidden behind a bunch of dowdy sweaters that looked very sad. The lesson here; step outside your comfort zone and look in stores you normally don’t visit when shopping, you could be pleasantly surprised! Along with my new BFF the chambray shirt, I also bought these boots which …you’ll never believe it … are leather. I have never bought anything leather before, because I figure since I don’t eat cows, I shouldn’t wear them either. Sadly, after ending up with ripped and ratty looking boots every fall and as a result freezing toes, I gave in to leather. If you read my post about fall wardrobe inspiration you’ll remember that flat bottomed brown boots were on my must buy list. I was pleasantly surprised when a client of mine gave me a gift card as a thank you for some work I’ve done for them recently, and decided to splurge on a great pair of boots. Now I have some money in budget for wish to buy items! Great outfit. Loving the boots. Don’t forget to stop by and link up this Thursday for my weekly Tres-Chic Fashion Thursday Link Up. Hi Agi – Thanks for the visit… I will try to remember! Thanks Kalyani – they are totally out of my comfort zone, but they are comfy and great for boots! Love the denim on denim! Especially the dark chambray shirt color. Really cute look! I love your scarf. This is such a cute outfit. I love chambray, especially for fall, so wear away! 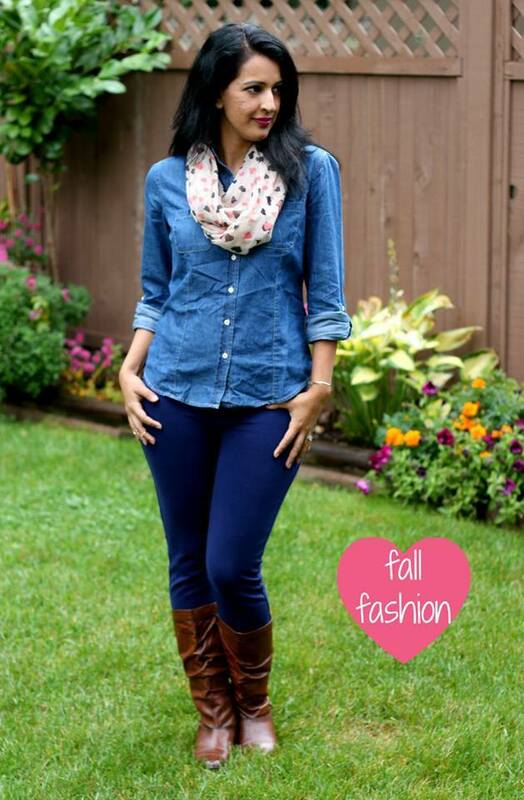 This outfit is so perfect for fall, and you look great!! You have to love a denim shirt–glad you finally found your perfect one!! And that is a very pretty scarf! What a CUTE scarf… love it. Loved the complete look. The shirt, boots and scarf. Everything is just perfect. A great pair of brown leather boots are definitely on my fall wish list – and those scarves sound like a great deal!